Posted on July 11, 2016 at 10:00 am. Seedlings cannot be successfully transplanted into a garden without hardening off. 80% of my seedlings directly transplanted died from the day’s heat or the night’s cold. I thought that hardening off meant leaving them outside for a morning or afternoon and then bringing them in for the rest of the day and night, for about 10 days. Many of my brassicas (cabbages, broccoli, and cauliflower) died indoors after only one such treatment. It turns out “hardening off” means giving them 10-15 minutes of outdoor air at a time and slowly increasing the time until they are comfortably acclimatized. So-called “lasagne beds” aren’t always the best way to garden. You should really follow all of the instructions and steps. 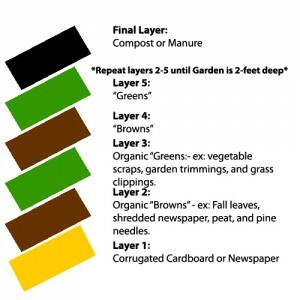 If you have plenty of room and a LOT of material to work with, they might work, but a layer of branches followed by a thin layer of leaves, followed by soil in a raised bed does not make a great garden. The one bed I made this way is the driest bed in my entire garden, as all the water drains right through it. The back edge receives enough moisture to grow peas, and the front tomatoes and golden purslane, but most seeds dry up and die in that garden. The higher from the ground the garden bed, the fewer the weeds. My ground-level gardens are full of weeds. The slightly raised beds are better, but the waist-height ones are a breeze to weed by comparison. New soil makes a terrible growth medium. One of my waist-high, self-irrigating beds was filled with soil from previous beds that needed replacing. One was filled with new soil. The one with old soil is so filled with greenery that you have to dig through the two-foot-high vegetation to find anything. The one with new soil contains all of my celery and celeriac and peppers and marigolds. The only things growing well are the marigolds. The rest are in a very sorry state. My ground cherries are half the size of the ones in the other bed, the peppers are near-dead, and the celery hasn’t significantly grown since transplanted. With all the established insects and microbes, old soil is the clear winner. Self-irrigating beds, or ones containing water reservoirs below the soil, provide more benefit than just reducing watering demands. Plants that like more water than others and like to be buried, like celery, can be more easily grown in these beds because you can plant them at a greater depth where the soil is more moist. What have you learned from your garden this year? Comment below.